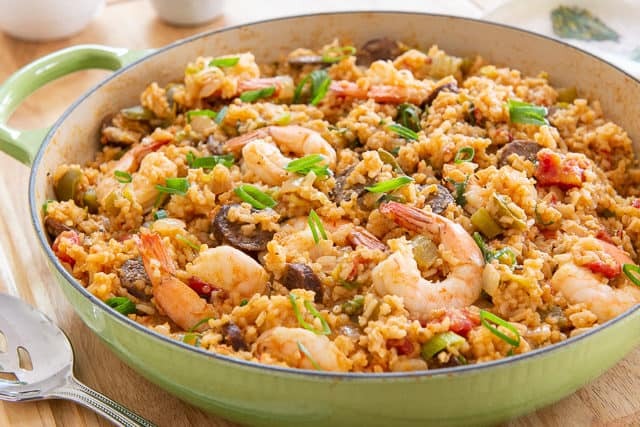 This Jambalaya is flavor city, with smoked andouille sausage and shrimp, the Cajun holy trinity of onions, peppers, and celery, fire roasted tomatoes, and more. It’s a hearty meal that makes for great leftovers! I think it’s impossible to go to New Orleans and not fall in love with the food, and Jambalaya is one of their culinary gems. 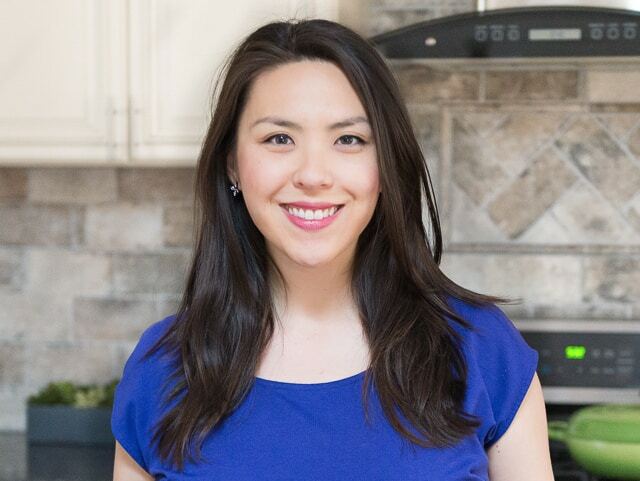 It’s one of those dishes where there are so many bold flavors going on that it might seem complex, but this recipe is actually really easy and quick to make. It’s also completely one-pot, so there’s minimal mess-making in the kitchen. You end up with a big batch of food that can feed a crowd, all served in the same pan it’s cooked in. 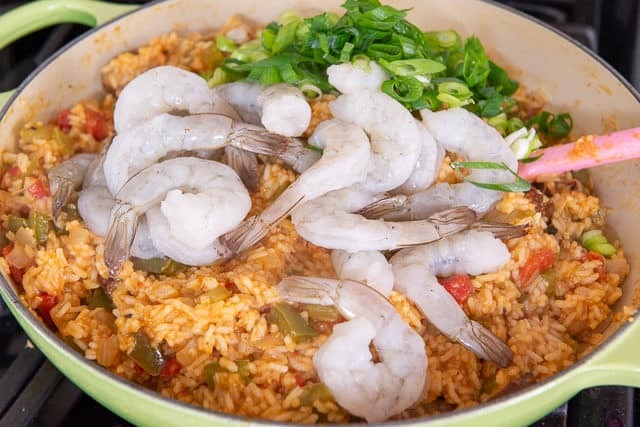 There are a ton of variations with a dish like jambalaya, and if you look up 5 different jambalaya recipes, you’ll see 5 pretty different ways of making it. But that’s exactly what’s nice about this dish, is you can tweak it to your tastes. I see chicken used a lot for instance, but I’ve always preferred shrimp, so that’s my main protein here. 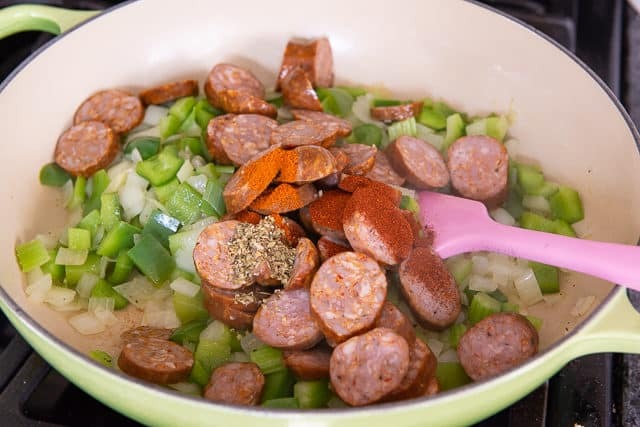 Just make sure you retain the important elements for jambalaya, which are the andouille sausage (a must), the holy trinity vegetables, and either a true Cajun seasoning or a trio of spices that mostly capture those flavors. Keep cooking for another 5 minutes, until the sausage renders its fat and flavor, and continues to cook the vegetables even more. Stir that around for about 3 minutes, to toast the rice. Throw a bay leaf on top, then the rice is ready to cook with the lid on. Simmer on low for about 15-20 minutes, until the liquid is almost all gone, and the rice is nearly tender. 40 Clove Garlic Chicken, Ramen Noodle Stir Fry, and Fried Rice are some of my other favorite one-pan dinners. Enjoy! 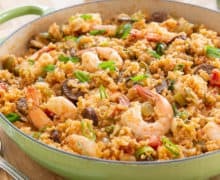 How to reheat Jambalaya: Be really careful not to overcook the shrimp, and either reheat in the microwave or on the stove, making sure to pull the food as soon as it’s warm. You may even want to take out the shrimp and reheat separately so the shrimp doesn’t get rubbery. Can Jambalaya be frozen? Yes, in an airtight container for up to 2 months. 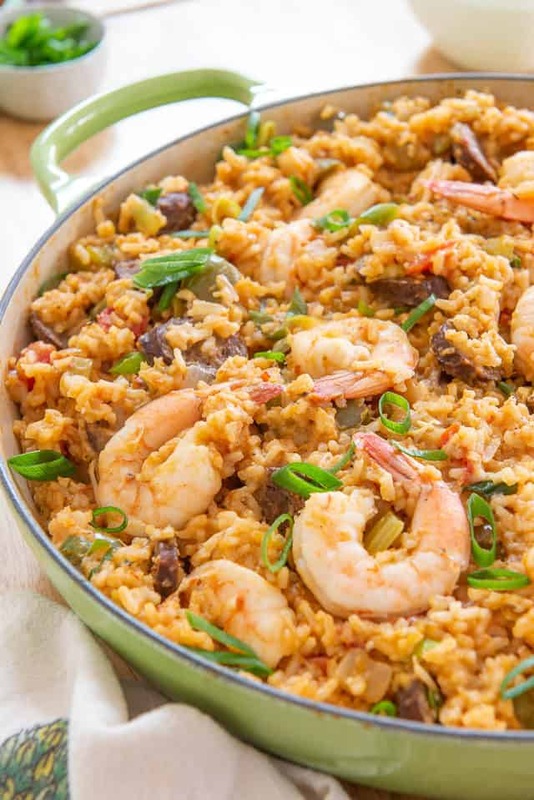 Can Jambalaya be made ahead? Yes, and leftovers will keep for 3-4 days. 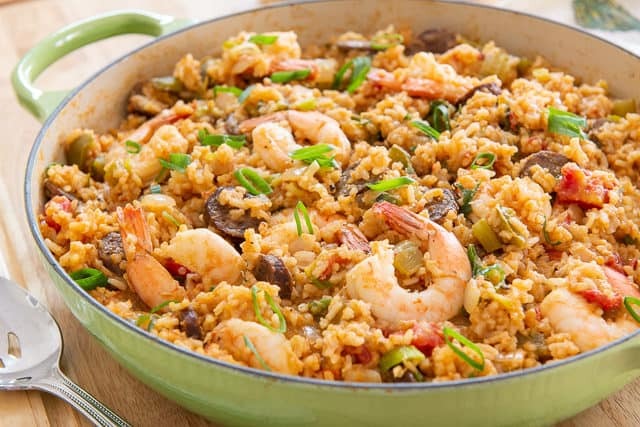 This flavorful jambalaya has andouille sausage for a smoky and meaty flavor, along with shrimp, peppers, onions, fire roasted tomatoes, and more. In a large wide pot (I used a 5-qt braiser, but you can also use a big soup pot), heat the oil over medium to medium high heat. 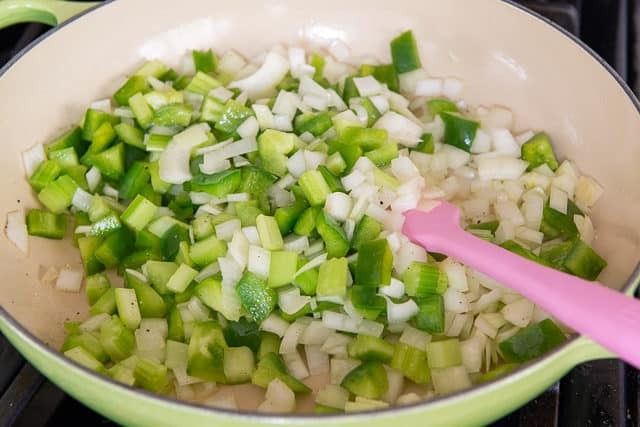 Add the onions, peppers, and celery, and season with 1/2 tsp salt and 1/4 tsp pepper. Cook for 7-8 minutes, until slightly softened. 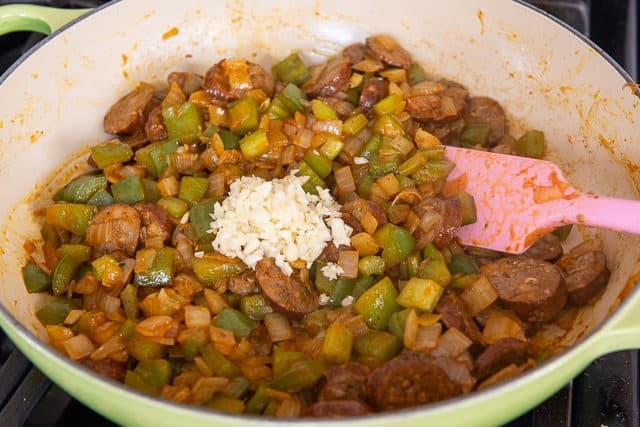 Add the sausage, paprika, cayenne, and oregano, and continue cooking for 5 minutes, until the fat and flavor from the sausage have rendered out and further softened the vegetables. Add the garlic and stir for 30 seconds, then add the rice. Stir continuously for 3 minutes to toast the rice. 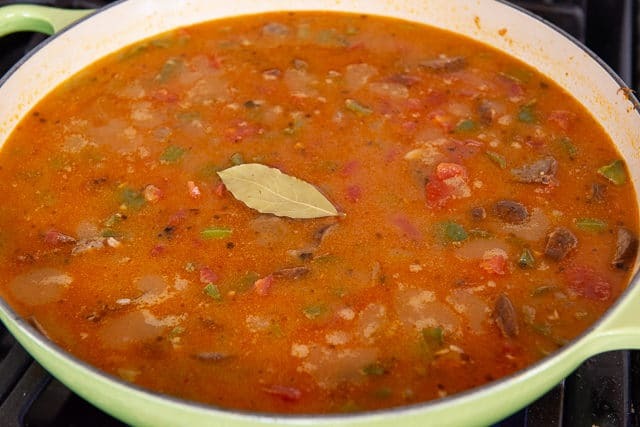 Add the chicken stock, 1 cup of water, tomatoes, and bay leaf, bring the liquid to a boil, then reduce to a simmer over low heat. 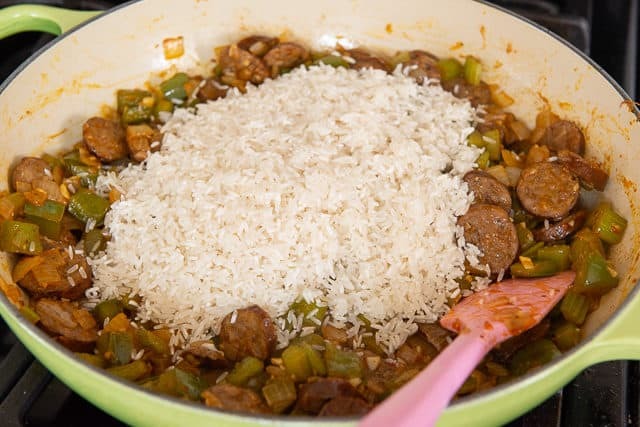 Cover the pan with a lid and simmer for 15-20 minutes, stirring occasionally so the rice doesn’t settle and burn on the bottom. When the liquid is mostly absorbed and the rice is nearly tender, stir in the shrimp and scallions, cover with a lid, and turn the heat off. Let the pan sit on the stove for another 5 minutes, to gently cook the shrimp. The jambalaya is now ready to be served and enjoyed! *Sometimes I end up with a little more vegetables depending on the sizes I get from the store. I've made this with up to 3 cups of yellow onion, 1.5 cups of bell pepper, and 1 cup of celery. Try to keep to those ratios the best you can. **This is fairly spicy with 1/2 tsp cayenne. For less spice, cut the amount in half. ***Since a carton of chicken stock is usually 4 cups, I usually add another cup of water rinsing out the carton and the tomato can, so as not to open another box. However, you can use 5 cups of chicken stock if you want to maximize flavor. ****I typically use 16/20 size shrimp. If you use smaller shrimp, it will take less time to cook. Be careful not to overcook the shrimp! When in doubt, cut into one. Post updated in April 2019. Originally published April 2011. I think we’ve all eaten those type of pouches at one time or another! I’m with you though, this is definitely better than a pouch. 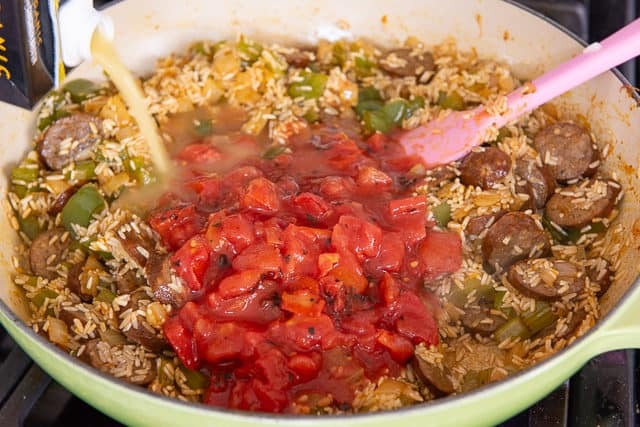 My husband has recently asked me to make Jambalaya, but I didn’t really have a “go – to ” recipe… I think I’ve found it! Thanks! HAHA I’m glad to know my husband and I are not alone! 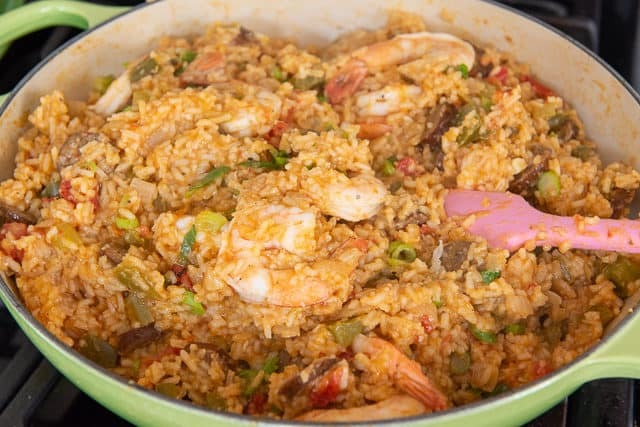 My husband and I really liked this jambalaya…it’s easy and has great flavor. I want to add chicken thighs. When/how do I add them during the process? Would you do bone-in or boneless?